The Capital Area Jodokai, in association with the Godaiko Jodokai of Wisconsin, is pleased to announce our 4th annual training camp, which will be hosted at the campus of Bryn Mawr College, near Philadelphia, Pennsylvania. The dates of the event are Friday, July 21 through Sunday afternoon, July 23. The entire event will be held on one site, and the group eating and relaxing together. We will also have extra practice on July 24, Monday (day and evening) and July 25, Tuesday morning. Applications are available from each group leader and payments can be made via Paypal by filling out the information below and following the link to Paypal. The Capital Area Jodokai studies Shindo Muso Ryu Jodo. The art was invented by Muso Gonnosuke around 1600 and, according to tradition, was used by Muso to defeat Miyamoto Musashi in a duel. Please read on or go to the external Capital Area Jodokai websitefor more detailed information. The art is built around using a staff a little over four feet in length matched against a sword. 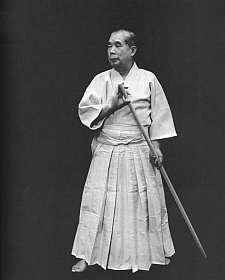 In addition to the jo, Shindo Muso Ryuincorporates teachings from five other schools: Shinto Kasumi Ryu kenjutsu (sword), Uchida Ryu tanjojutsu (walking stick), Ikkaku Ryu juttejutsu (truncheon and fan), Isshin Ryu kusarigamajutsu (sickle and chain) and Ittatsu Ryu hojojutsu (rope-tying art). Shindo Muso Ryu was kept for three hundred years as an art restricted to retainers of the Kuroda clan in Fukuoka City, Kyushu. Approximately 80 years ago, Shimizu Takaji Sensei was invited to come to Tokyo by Jigoro Kano, the founder of judo, to teach at Kano's dojo as well as at other prominent dojos around Tokyo. The art of jo so impressed authorities, that they began to arrange teaching for the police. After the war, jodo was one of the first martial arts allowed to be practiced again by the occupation authorities, primarily for study by police. Shimizu Sensei also taught jodo at the Rembukan dojo in Tokyo. Among his many famous students was the American, Donn Draeger Sensei (who received a posthumous menkyo kaidan or certificate of full transmission of the art). Upon retiring from the Tokyo Police, Shimizu Sensei was succeeded by his protege, Kaminoda Tsunemori Sensei, as instructor of the 4th division of the riot police, which is charged with guarding the Imperial family. Kaminoda Sensei also succeeded Shimizu Sensei as instructor at the Zoshukan (which became the new home for the Nihon Jodokai when the Rembukan was demolished) upon Shimizu Sensei's passing. Kaminoda Sensei was a close friend of Draeger Sensei and they learned the art of jodo together. Today, there is no longer a recognized headmaster for Shindo Muso Ryu . Instead, the art is directed by a handful of senior Japanese instructors. We follow the teachings of Kaminoda Sensei of the Nihon Jodokai in Tokyo. He is Menkyo Kaiden, hachidan hanshi, chief instructor at the Zoshukan Temple dojo in Tokyo and the recognized headmaster of Isshin Ryu kusarigamajutsu. He is also the author or coauthor of authoritative volumes on kusarigama, jutte, kenjutsu, tanjo and the definitive jodo volume, Jodo Kyohan. Through regular contact with Japan, senior members of the Capital Area Jodokai try to improve their skills and adhere to the traditions of their teacher and their teacher's teacher. 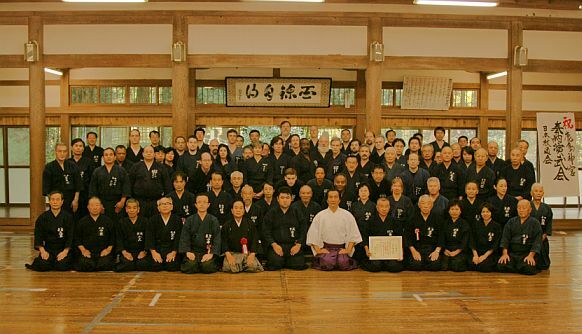 Though Shimizu Sensei succeeded in having jodo added to the set of arts tested by the All Japan Kendo Federation (ZNKR), Kaminoda Sensei does not ask us to participate in the dan testing system, nor do we spend much time practicing Seitei jodo. The emphasis of this group is on learning the entire ryu and its associated arts - truly a lifelong effort. Instead of black belts, senior members have received certificates of accomplishment from Kaminoda Sensei as we have mastered different sets of koryu kata. In some cases, Sensei has issued traditional scrolls--not really ranks. There are only four traditional scrolls: Oku Iri Sho,which marks entry into the ryu, and the three teaching licenses of Sho Moku Roku, Go Moku Roku, and Menkyo Kaiden. Our senior instructor, Dan Pearson, has Go Moku Roku, and two of our other members, Steve Hick and Richard Strausbaugh, have Oku Iri Sho from Sensei. Dan Pearson and Ray Espirito also have a Sho Moku Roku (license to teach) in kusarigama. When learning Jodo, students are typically first taught the jodo kihon. These are made up of 12 basic movements that appear and reappear throughout the rest of jodo. There is no free-style sparring in jodo. All the paired work is done in the context of kata (patterned partner practice) with sword and jo. Some doubt the efficacy of kata as a method for teaching effective techniques, but 400 years of applied success suggests that this criticism is unwarranted. The student is typically taught the first jodo kata (tachiotoshi) at approximately the same time as they are learning kihon. This gives them a feel for what the kihon are meant to be like when used against a sword. Depending on talent and effort, the student will be taught the rest of the first set of kata, Omote, and then work through the remaining curriculum. There are seven sets of kata (not counting the gokui or secret techniques) with over 60 total katal. Each set is arranged to bring the student along to a new level of self-mastery and insight. Early in a student's training they may be shown tanjojutsu. With more time, the student should be taught kenjutsu, as understanding the logic of using a sword will improve the quality of their jo practice. Eventually, if the student wants to, they may learn jutte, kusarigama and hojojutsu. Please contact Dan Pearson, Menkyo in Shindo Muso Ryu Jodo, at dan@shindomusoryu.org, if you are interested in this traditional Japanese weapons art. For more information on studying jodo, please contact Dan Pearson at dan@shindomusoryu.org.